The President of the Republic of Liberia, Mrs. Ellen Johnson-Sirleaf (R), and FUNAAB Vice-Chancellor, Professor Oluwafemi Olaiya Balogun savouring the joy of the Courtesy Visit. The President of the Republic of Liberia, Mrs. Ellen Johnson-Sirleaf, has expressed the gratitude of the government and people of Liberia, over the support rendered by the Federal University of Agriculture, Abeokuta, in rebuilding the country after the war. President Sirleaf gave the commendation while receiving in her office, the Vice-Chancellor of the University, Professor Oluwafemi Olaiya Balogun, who paid her a courtesy visit, last Tuesday, in Liberia. According to the President, the University’s contribution was invaluable and significant to the volume of international assistance mustered to give a new lease of life to the post-war Liberia. Referring to the University’s Foreign African Scholarship Scheme (UFASS), which Liberia, alongside other West African nations benefit from, President Sirleaf said, “We appreciate what you are doing for us, especially, in the areas of capacity building and skills acquisition…I cannot begin to tell you what this has done for us, given our experience of war and the need to rebuild”. She reiterated that Liberia required skilled manpower to work in its industries and ministries and as such welcomed all opportunities of training its workforce, towards the accelerated revival of its battered economy. The President of Liberia, Mrs. Ellen Johnson-Sirleaf (2nd Left), FUNAAB VC, Prof. Oluwafemi Balogun (3rd Left) while from Left is Liberia’s Minister of Agriculture, Mrs. Florence Chenoweth, DVC (D), Prof. Kolawole Salako, Director (INHURD), Prof. Babatunde Kehinde and Head (PR), Mr. `Lasun Somoye. 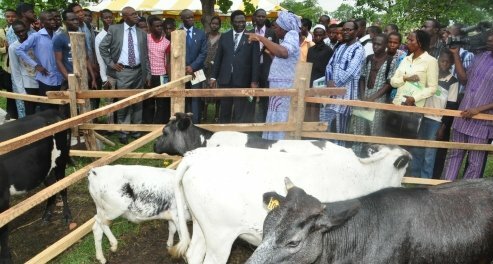 The President said the first batch of Liberian scholars that benefited from the scheme had since returned home and placed in different institutions, especially, in the agricultural sector, where she said they had been contributing to the socio-economic revival of the country. Mrs. Sirleaf commended the quality of the University’s curricula and infrastructure, which she noted was responsible for its recent Le Matinal Educational Excellence Award as the Best University of Agriculture in Africa. The President said she looked forward to another opportunity to, once again, visit the University and express her personal gratitude to the entire community for their support and encouragement. The Vice-Chancellor, Professor Balogun, had earlier delivered a congratulatory letter from the University, felicitating with Mrs. Sirleaf on her conferment as the current Nobel Peace Prize winner, as well as for her electoral victory, for a second term tenure as President of the Republic of Liberia. Professor Balogun assured the President of the University’s resolve to be part of the rejuvenation of Liberia, using the potency of the weapon of economic empowerment, through the human capacity development of the country’s youths and workforce. The Vice-Chancellor disclosed that the University currently sponsors six Liberian nationals for empowerment and skills acquisition programmes under UFASS, reiterating the preparedness of the institution to explore all avenues of assistance towards a speedy socio-economic development of Liberia. Professor Balogun said the courtesy visit to President Sirleaf was deserved, as the entire University community shares in her aspirations and also convinced of her capability to drive the socio-economic and political repositioning of Liberia. The Vice-Chancellor observed that the award of the Nobel Peace Prize on Mrs. Sirleaf, underscored the appropriateness of the conferment of the University’s Honorary Doctorate degree on her and that the honour was also a testimony of her passion and selflessness to humanity. The Vice-Chancellor, later on behalf of the University community, presented a motorised, indoor water fountain to President Johnson-Sirleaf, who said she will consider the possibility of putting it in a public place for better appreciation by Liberians. On the entourage of the Vice-Chancellor for the presidential courtesy visit, was the Deputy Vice-Chancellor (Development), Professor Felix Salako, the Director of the Institute for Human Resources Development, Professor Babatunde Kehinde and the Head of Public Relations, Mr. ‘Lasun Somoye.